Here is a partial list of ghost hunting equipment we use during our paranormal investigations. Each investigation is unique in its own way and may required different equipment. We are constantly experimenting with new equipment and ideas in our research. Listed below is the equipment CCTOPS has acquired through the years that we use in our ghost hunting and paranormal investigations. It has been quite costly for us to pursue our research and to help those in need. We try to update our equipment as much as possible and if you choose to help fund our research it would be greatly appreciated. We have experimental equipment that we are using now and many more on the drawing table. I will show and explain some of our experimental equipment and ideas on a different page soon. Please be patient with us. As I said before, we are paranormal investigators, not web designers. Digital Camera – Pretty much any brand of digital camera can be used for ghost photography. I suggest a camera with at least 5.0 mega pixels, so you can zoom in to analyze anomalies. No matter which camera you chose, you should have it set on a higher resolution. I love my Sony, cyber shot with nightshot, and have had incredible luck with it. Some of my fellow investigators also swear by it also. It is personal preference actually and your price range. Audio recorder (digital): There are many digital recorders on the market ranging anywhere from $50.00 to several hundred dollars. Whichever you chose, you should set it on high resolution. Some recorders have a setting for dictation or conference. The dictation setting should only pick up noises that are close to the recorder, while the conference setting will also pick up noises further away (including passing cars, people in other rooms, etc.) You may wish to experiment to determine which works better for you. Some investigators also prefer to have their recorders on voice activated mode. The plus is that you don’t have to sit through hours of listening to nothing. The minus is that it takes at least one syllable to activate the recorder, so if you do get an EVP, you may miss some of it, if not all of it. I personally think that listening to nothing for hours on end builds ghost hunting character! Pay your dues. Also, some digital recorders have limited memory so be aware of that also. You can also use them to interview witnesses. Electronic Voice Phenomenon (also known as EVP or white noise) is one of the most common ways that spirit beings reach out into the mortal realm. To better collect data of possible EVP during your paranormal investigation you will want to have a digital audio recorder on hand. The recorder then needs to be placed in an open area to more easily pick up voices or sounds that have no known source and will not be confused with the natural noises of the area. Listen to the recording individually by yourself before letting your other team members listen to it by themselves as well. Each of you should take your own notes (making sure to mention any natural noises you hear as well) then compare later with the team members hearing the recording without knowing what the other people heard to inadvertently influence their own ideas of the sounds. Night vision: Night vision can be a handy tool, but is not necessary for investigating. Most investigators use monoculars, such as the Night Owl Cyclops. If you do decide to invest in night vision, be sure to get something with an infrared option. Regular night vision allows you to see in very low light, as it greatly magnifies what light is available. The infrared option allows you to see clearly in zero lux (complete darkness) and a great deal of paranormal activity seems to happen within the infrared spectrum. Camcorder: Video cameras are great investigating tools for several reasons. One reason is that you can use them to completely document your investigation from start to finish. This can help determine exactly who was where during your investigation. It will also help to document any activity, even if you don’t actually catch the activity on tape. You can also use you video camera as an extra investigator. To do this, you can set up your camera in one room, while conducting other business in another room. If you attach the camcorder to a monitor, you can watch the action in "real time". Most investigators, however, watch the video footage later. I have seen strange things be caught on regular camcorders, in full daylight, but this is rare. Most investigators use a camcorder with a night vision feature with an infrared light. Sony is the only manufacturer as of this writing to make this type of camera, and the product line is called Night Shot. Sony Night Shot camcorders are available in both digital and analog models. The infrared beam within the camera only works for a short distance (about ten feet), so I suggest you also invest in an infrared light, which reaches to about 100 feet. I believe that this is one of the best pieces of equipment to invest in. Motion detectors: Motion detectors are usually used in conjunction with another piece of equipment, such as a video camera. They are also generally used in pairs, with one set on "chime", and the other set on "alarm". The problem with motion detectors is that they are most often set off by the investigators themselves and can, quite frankly, easily get on the nerves of the property owner. I usually shy aware from using them myself. EMF meters: Since many spirits or beings that interact with humans on the mortal plane do not have the power or perhaps desire to physically show themselves, you will need other tools to see them or to determine how they are working with or acting upon the environment. Many paranormal entities can hide themselves from humans while dealing with physical objects in the human realm but cannot keep their own electromagnetic fields concealed. Therefore, attaining an electromagnetic field meter would be very useful in the case of a being that has been interacted with but not seen. A Trifield meter is the best for these investigations as it can discern fields from electric and magnetic sources in addition to the detection of microwave emissions. This tool also proves helpful in pre-analysis studies to determine if the occurrence is actually paranormal or simply a natural or man-made phenomenon since those sources need to be ruled out before further work is conducted. An EMF meter or Trifield meter can easily monitor these origins since natural electric sources do not rise and fall along the meter as often as man made ones do. EMF DETECTOR: Three kinds of instruments are generally used to detect electro-magnetic fields (EMF). They are the electric field, magnetic field, and radio frequency (RF) meters. The favorite for most paranormal researchers are the Multi- field Meter, which measure two to three of these fields at once. They usually feature a fast reacting needle gauge, at least two sensitivity scales, and are very easy to use. Other meters monitor the combined magnetic and electric field strength and are known as Gauss meter (or Teslameters). The ELF (Extremely Low Frequency) models are best for paranormal research. For monitoring microwave and radio frequencies and also help detect hidden sound or spy equipment, the paranormal researchers make use of RF Meter It should be noted that all gauss meters, electric field meters, RF/microwave meters, etc. can only measure the strength of the field at the location of the meter. The meters can be placed in stationary positions or used like mobile probes while walking around during an investigation. What distinguishes one meter from another is the sensitivity (or the smallest field strength that the meter can detect). For instance, a gauss meter with sensitivity of 0.1 mG (milligauss) is ten times more sensitive than a meter that can only detect down to 1.0 mG. While a more sensitive meter can be successfully used further away from the source of the field, it is still only measuring the weaker field at the location of the meter. In looking for a more sensitive meter, compare the minimum sensitivity rating of one meter to another. How effectively a meter can detect a field depends on the strength of the field at the source, the pattern of radiation from the source, and the rate that the field decreases with distance (1/d, 1/d², 1/d³, etc.). Some EMF sources may have symmetrical field patterns, some may not. A single-axis detector is sensitive to the field directly in front of the probe and must be rotated during use to find the proper orientation to the source field being measured to get accurate readings, while a three-axis detector is sensitive all around the probe and is Omni directional. Electro-Magnetic Field Detectors are used to measure the electric energy and magnetism in an area. There are many different types on the market. Some have digital displays, some only have lights, but most do the job equally well. The Gauss meter on one end and the tri-field on the other end. The tri-field meter is especially valuable to ghost investigators because it has a squelch mechanism, and only measures natural energy, meaning that it blocks out electrical wires, pipes, etc. It is actually my favorite one with many settings. I have a wide range of meters and its great to have a selection but not necessary. Be aware that some EMF meters have on and off switches, others don’t. Some have a button that requires to be pressed continuously. No matter which model you choose, an EMF meter is a must-have for any serious investigator. Thermometer: Thermometers are useful to investigators because a temperature change often accompanies a paranormal event. You can use a regular outdoor thermometer (which may be difficult to read in the dark), or you may wish to purchase an infrared thermometer. These have an infrared beam which you can point at an object and get a digital temperature reading. These work quite well because you can point them into corners and under furniture. The beam will read the temperature of the first thing it comes in contact with, so if there is an entity between you and the wall, and you point it at the wall, you will actually get the temperature of the entity. One of the most common characteristics of a paranormal event is the feeling in the atmosphere. Many people who encounter supernatural beings try to describe the sensations in the air that come along with the presence of the entity. Yet, other than the sensitivities felt by first person eye witnesses there can be actual data collected to support their claims. The easiest type of this data to gather is the temperature in the air. Whenever a spirit is present rooms will have cold spots or entire areas that experience a sudden drop in temperature. A thermometer is very handy in these situations, but rather than a normal temperature gauge like the one on your front door you will be much happier to possess a more high tech device. A laser thermometer can immediately store large amounts of data that can be later uploaded to a computer for analysis. Since they do not need to be constantly hooked into the computer you will be using though, they are very convenient to have around even on the most last minute investigations. The looking into of temperature variations is very useful when comparing other collected evidence from the events to determine paranormal interactions. Raudive Diode Konstantin Raudive was a Latvian psychologist and parapsychologist who studied under Carl Yung. In the '60s he carried-out many EVP experiments and devised a method where the microphone was replaced with a germanium diode device, essentially a de-tuned 'crystal set', generating 'white noise'. This has become known as a 'Raudive Diode'. Raudive made recordings using a 'Raudive Diode' receiver connected to the microphone socket of a tape recorder. During the recording session he asked questions, encouraging the dead to communicate with him. On playing back the tape, voices were heard on the recording. These became known as 'Raudive Voices'. His work was published in his 1971 book 'Breakthrough'. Raudive died in 1974 The device creates two Raudive Diode circuits in one unit that you can record together using any voice recorder with a microphone jack. 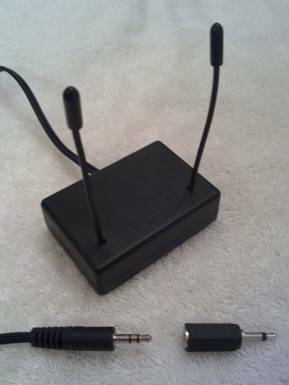 Just connect to a microphone jack on a PC or digital recorder. One receiver connects to the left channel, the other to the right. Adaptor supplied for connecting to a mono microphone jack (mixes both signals together). On a PC you can use software such as 'Audacity' to capture and analyze any audio you hear This is technology from the 1960’s and 70’s, so always be open to older ideas and well as new ones. You will find that the diode will not pick up your own voice or any noise contamination from your recording area. I enjoy experimenting with this device. Pen and Pencil: If you are not keeping notes on a voice recorder, than you should do it with a pen and pencil. Keeping notes during an investigation is crucial to your investigation report. Everything that happens, no matter how seemingly insignificant, and the time at which it happens should be documented. When you compare notes afterward with the other investigators, you just may find a pattern to the activity! Compass: This is another very simple tool which can be of great use, especially if you don’t have an EMF detector. When you reach an area of high energy, the compass will spin in complete circles. You can even get models that glow in the dark. Batteries: These are a very simple tool that you can never have too many of. Despite their simplicity and low cost, most investigators eventually find themselves running out of them in the middle of an investigation. We suggest you pack several sets of each type of battery you use. Many times batteries can become suddenly drained in a haunted location, so we suggest you carry an extra set in your car as well. Also, you may wish to use rechargeable Nickel-Cadmium batteries in your digital camera, as they last about 10x longer then regular batteries. Two-way radios: These can be very useful if you are conducting an investigation in a large building or area. With the use of two-way radios, one half the groups can go in one direction, and the second half can go in another, while still keeping in touch incase something incredible happens. Nice to have also if someone is monitoring the cameras.